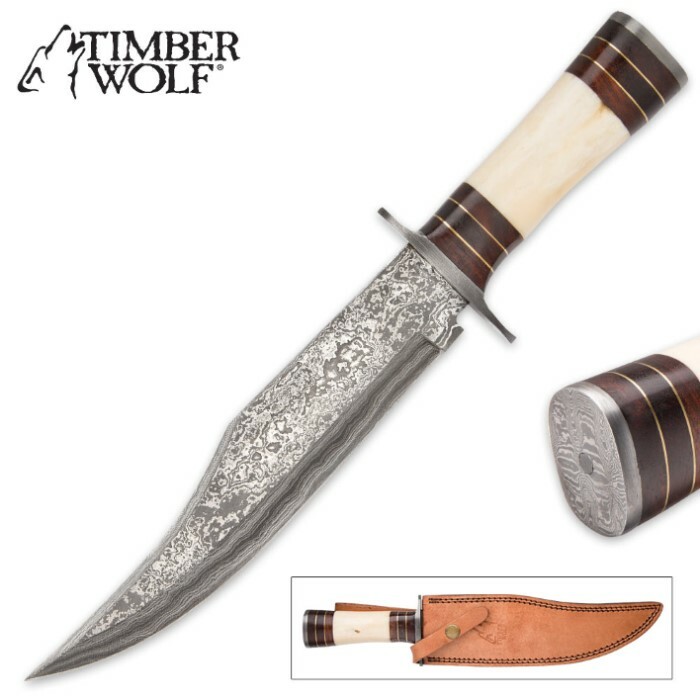 Timber Wolf Stillwater Damascus Bowie with Genuine Leather Sheath - Camel Bone and Walnut Handle | BUDK.com - Knives & Swords At The Lowest Prices! From first glance, Timber Wolf's Stillwater Bowie is nothing short of breathtaking. Its impressive size catches the eye and stunning aesthetics keep you looking. Incredible fine detail demands closer examination, and, next thing you know, you're hooked - unable to divert your gaze from this mesmerizing masterwork of fixed blade design and engineering. Forged from quality Damascus steel, the powerful, imposing clip point blade is a carefully honed work of art all its own - a vast sea of rippling, contrasting lines, intricate swirls and other bold patterning. Master bladesmiths painstakingly hand-forge every one, employing an ancient technique that involves repeatedly firing, folding and hammer-welding two distinct varieties of high carbon steel. Once the metals are inseparably fused, a final acid etching highlights the vivid contrasts in the resulting layers. The process is slow and meticulous - often taking days and requiring the precision only a skilled artisan can offer. No mechanization. No automation. And like a snowflake, the patterning on each and every Stillwater blade is one-of-a-kind. Glowing with delicate shades of cream, ivory and pearl, the genuine camel bone handle is equally impressive and equally strong. 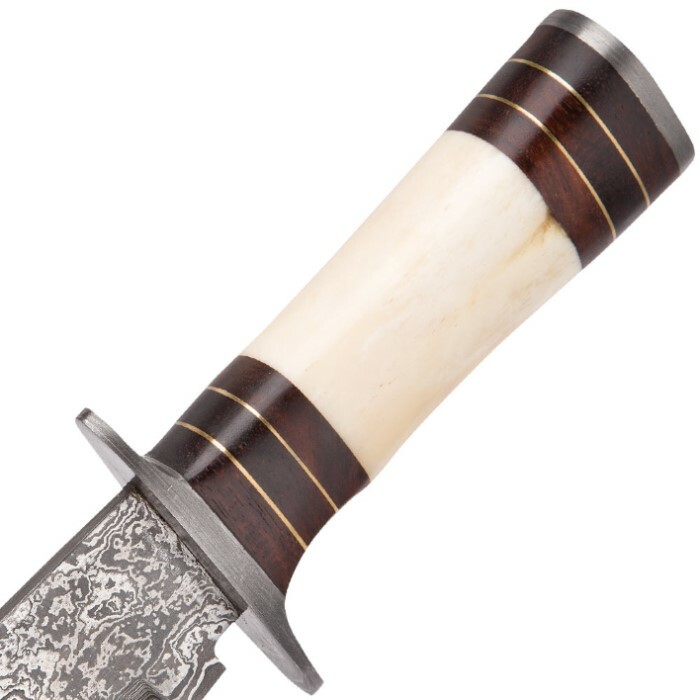 Rich, dark walnut and vibrant brass spacers beautifully offset the light-colored bone, and the Damascus steel guard and pommel provide visual unity with the blade. As remarkably gorgeous as it is, the Stillwater is just as tough, boasting rock-solid full tang construction. Simply put, it's just plain extraordinary all-around; it makes quick work of any cutting job, it withstands the rigors of back country adventures, and it's an attention-grabbing beauty in the display case. But "if you want to taste the water, you've gotta come to river." Order today, and let the "Stillwater" quench your thirst for a superior Bowie.